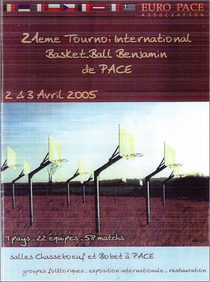 Relive the best moments of the Euro Pacé tournaments ! Rendez vous les 23 & 24 mars 2019 !!! Rendez vous les 24 & 25 mars 2018 !!! 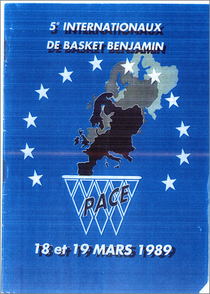 NANTERRE (France) wins Euro Pace for the first time and deprives VILNIUS SKM (Lithuania) of a second win. 30 teams from 13 countries participated in this competition. 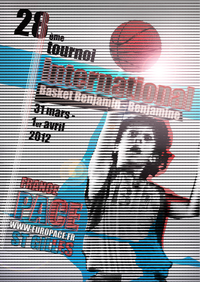 A first victory for the local CO PACE team (France)! The team was composed of : C.Vaglio, A.Le Roux, N.Till, J.Mahi, N.Blandin, F.Heitz, M.Pilet, F.Caratto, I.Martin, R.Battais - Coach: L.Pilet. 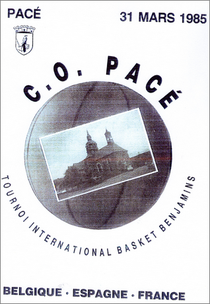 The girls of CO PACE were one point ahead (30-29) against PLZEN (Czech Rep.) in an atmosphere of madness! 14 teams competed for victory in a competition with a very high level. 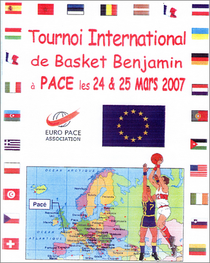 SKM VILNIUS (Lithuania) won Euro Pacé facing the selection of ILE DE LA REUNION (France). 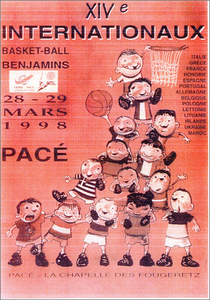 This is the 12th Lithuanian victory - and the 3rd loss during finals to LA REUNION - since the creation of Euro Pacé. LIEGE (Belgium) completed the podium. There was the 1st participation of a Turkish team in the tournament, with the presence of ANKARA. 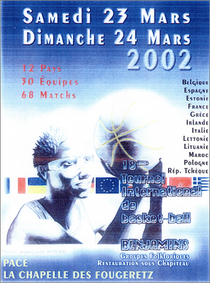 The 1st Czech victory on Breton soil with PLZEN (Czech Rep) - who won against the selection of Mayenne (France). 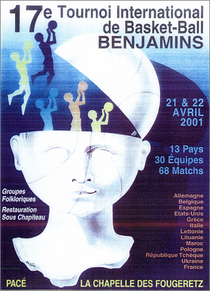 The selection of West RENNES (FRANCE) is celebrated on the podium for the third consecutive year ... but still no final victory! A 100% French boys final, and the third consecutive title for CHARENTON (France) - who scored a victory over the selection of ILE DE LA REUNION (France) making a return to Euro Pacé! There was the 1st participation of a Russian team in the tournament, with the presence of MOSCOW. A 100% French girls final, and taken for the 2nd time by Orly (France)! With 13 teams participating, the women's tournament continues increasing the number and above all the quality of the teams present. CHARENTON (France) had a second straight win for this 30th edition, against EUREKA MONZA (Italy), at the end of a magnificent final with a score of 34 to 28. Sweden played for the first time with a team from GOTEBORG, and classed 20th. 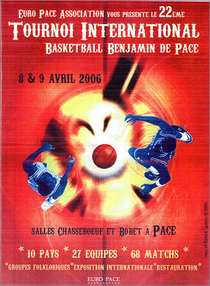 --> The Euro Pacé Association celebrated this 30th edition with a wonderful CRAZY DUNKERS show in front of an excited crowd ! 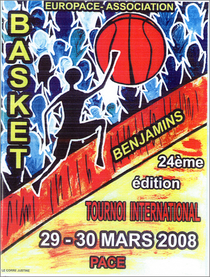 After a second place in 2012, ORLY (France) won the title against MORDELLES (France) who came second for the second consecutive year. CO PACE (France) makes it to the podium. In front of 1700 spectators (a record! ), the favorites of this edition presented themselves well ! 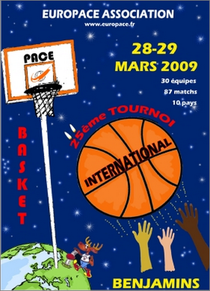 CHARENTON (France) -- already winners in 2010 -- won against PISEK (Czech Republic), who were themselves winners in 2011. --> Lots of excellent ambiance at Pacé ! Participating for the first time, GUADELOUPE won against Canton de MORDELLES (France) in a Girls' Tournament that has grown to 10 teams ! A good result for CO Pacé who got to 4th place ! The Americans from Rochester were a huge hit during 2 days in front of the Pacé public. Very good performance from CO Pacé who classed 4th. 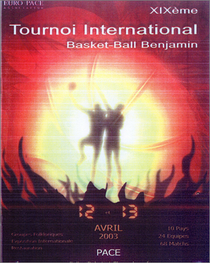 The Spanish LOGRONO team held onto their title against ORLY (France). 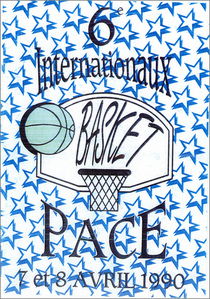 At the end of a very close final, SOKOL PISEK (Czech Republic) won a 3-point game against JUPILLE (Belgium), 38-35. The friendly LONDON (UK) team discovered the tournament, and we also had the return of teams and cultural groups from REUNION. It's the Spanish team LOGRONO that have the honor of the first name written in the prize list! CHINA is present for the first time at the tournament, with a team from Jinan. 11th victory from VILNIUS in 25 tournaments -- who can top that ? No-one ! It's a record since the creation of the tournament ! ALGERIA is registered for the first time. 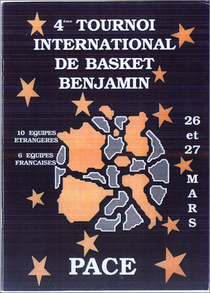 1985 - 2008 : The tournament is blowing out its 25 candles this year with 30 teams from 10 nations ! 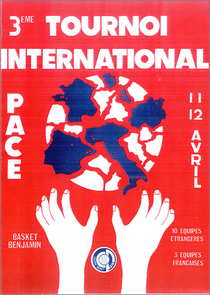 Euro Pacé has a new president: Michel Garnier takes over from Robert Lesaige. An Italian double: FORTI E LIBERI MONZA wins in the "selection" competition while GERARDIANA wins the "clubs" tournament against AMANN (making it to the finals from its second participation). 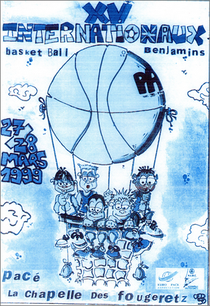 The RENNES PA (France) selection wins the "selection" competition, while GERADIANA (Italy) wins against CHERBOURG 33 - 20 to get the "club" tournament title. JORDAN discovers the tournament this year, fielding the AMANN team. A French double in the "selection" competition -- it's MAYENNE that wins the trophy against VITRE, 34-29. The Czech Republic keeps the "clubs" trophy this year thanks to SOKOL PISEK who crushed FORTI E LIBERI MONZA (Italy), 48 - 15. Italy is present in the final for the second time running. In the "selections" competition, VILNIUS takes revenge against CALVADOS (France) who beat them in 2003. A 17-point game, 39-22. The first Czech Republic victory in the "clubs" category, thanks to PRAGUE who won against FORTI E LIBERI MONZA (Italy). A French victory in the "selection" competition, thanks to CALVADOS winning against VILNIUS (Lithuania), with a resounding 51-22 ! LISSONE (Italy) won against SOKOL PISEK (Czech Republic) 50-35, in the "clubs" tournament. Third win for BARCELONIA (Spain) in the "club" competition. It's LIEGE (Belgium) that takes the "selection" title, rediscovering its path to victory after 7 years ! Carried by Martynas GENEVICIUS (winner of the 2012 EuroLeague with the Olympiakos Le Pyrée) VILNIUS gets its 7th straight victory in the "selections" tournament. Who will dislodge them from the highest step of the podium ? BARCELONE gets its second straight victory in the "clubs" competition. 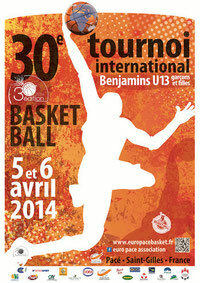 Nicolas BATUM participates in this year's tournament, with the CALVADOS selection. That's right -- the same who's with Portland in the NBA, and who's wearing the uniform of the French National Team. The USA is present for the first time in the tournament this year. BARCELONE (Spain) ends the supremacy of ARIS GLYFADAS (Greece) in the "clubs" tournament, beating the team of PAPAGOS representing... Greece!! VILNIUS continues to crush the "selection" tournament, with a 6th consecutive victory, this time against CALVADOS (France). A certain Rodrigue BEAUBOIS shows his talents on the Pacé floors, with the team from GUADELOUPE. He now plays in the NBA with Dallas, and was even NBA champion in 2011 ! The tournament just got more exotic with the first-ever presence of GUYANE (France), GUADELOUPE (France) who has a certain J. PETRO (2.02m at 12 years old ! ), and AZERBAIDJAN represented by the team of Bakou. While ARIS GLYFADAS (Greece) gets its third consecutive win, VILNIUS (Lithuania) gets its 5th ! The Greeks won against WYDAD (Marocco) ! This year, it's CALVADOS that must admit defeat against the formidable Baltic players. VILNIUS and ARIS GLYFADAS win again this year. VALMIERA (Latvia) et WYDAD (Marocco) are the unhappy finalists. The Greeks count among their number a certain Ian VOUGIOUKAS, today a professional winning player, notably in the 2011 Euroleague with Olympiakos from Athens. First victory for the Greek ARIS GLYFADAS team in "clubs". VILNIUS makes its third win against Liège, 38 - 33. 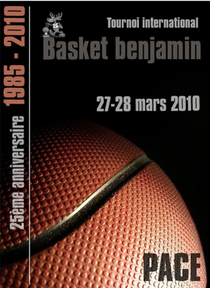 This edition (like the previous) is marked by the presence of Thabo SEFOLOSHA, who improves under the colors of the Canton de Vaud (Switzerland). He improves today in the NBA at the heart of the Thunders team from OKLAHOMA ! Robert Lesaige takes over from Henri Duvieilh as the president of the Euro Pacé Association. 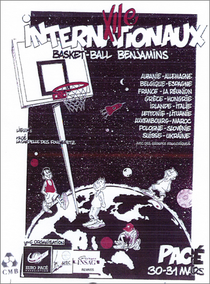 With this second edition, the selection of NORD (France) takes the "selections" tournament, while VILNIUS, represented by the Marciulionis school (founded by the player of the same name improving in the NBA), takes the "clubs" category. 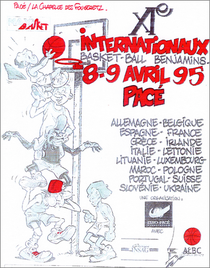 Already remarked by his first appearance in 1995, Rudy PICARDO, nicknamed "Pass Everywhere", playing with the colors of ILE DE LA REUNION gains the title "best upcoming" of the tournament. 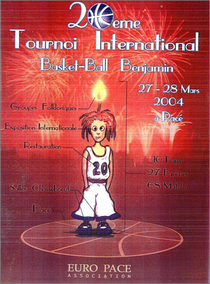 In 10 years the tournament has passed from 8 teams to 26 -- what an adventure ! GREECE, SLOVENIA and REUNION are present for the first time. VILNIUS (Lithuania) carried by Simas JASAITIS (still a player on the national Baltic team today !) puts an end to the hope of the local PACE team who finish second after a magnificent run -- no local team has finished as well since a victory in 1986 ! 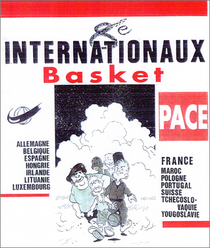 The selection from LIEGE takes the "selections" tournament. 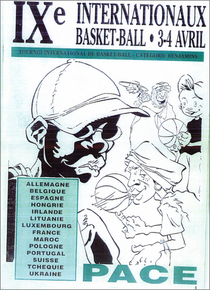 26 & 27 march 1994 : 10th edition ! 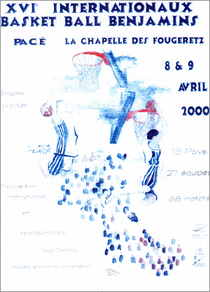 The organisation of the tournament is now in partnership with the ALBC of Chapelle-des-Fougeretz. The LA SALLE team (Spain) makes its second win in the "clubs" tournament, while LIEGE takes the "selections". First participation of Estonia with the TALINN team who drove 2900km (one way!) by bus to join us ! Congratulations ! Two tournaments are now organised -- one for clubs, the other for selections. 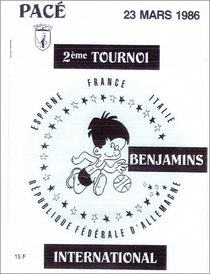 After three losses in finals, MAINE et LOIRE (France) wins the selection tournament, while LA SALLE BONANOVA takes the clubs tournament. The local CO PACE team finishes 3rd on the podium in the club tournament. UKRAINE discovers the tournament this year. Czechoslovakia (still unified) is represented for the first time by two teams from Prague. The team of AVEIRO (Portugal) carried by the exploits of Rodriguez wins for the first time, against Marocco. A team from LITHUANIA appears for the first time -- the delegation discovers the "charms of the west" and leaves wonderful memories. YUGOSLAVIA is represented by a team from Belgrade. A new crazy atmosphere for the revenge of the previous edition: the "Catalonia" spanish fans meet the "lièois" Belgian fans. In the end, it's the spanish who win, 28 - 20. 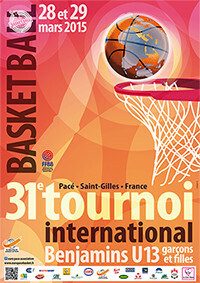 The tournament is more and more international, with teams coming from HUNGARY, POLAND and MAROCCO. Crazy atmosphere for the grand finale in the Cosec hall at Pacé. The public shared the atmosphere between the CATALONIA selection (Spain) and the Province de LIEGE (Belgium) who tried to gain a 3rd victory. It was the spanish who were victorious at the end of a magnificent and "noisy" duel, 23 - 15. 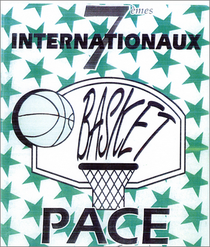 This 5th edition is marked by the first time presence of an Irish team. Pacé volunteers were at Le Havre Saturday to meet the ferry at 5h30 in the morning ! The trip didn't stop the Irish from finishing 4th -- congratulations ! 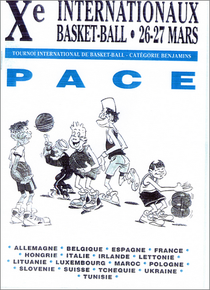 Neal CLARKE, the number 42, only 1m29 tall, conquered the Pacé public for several tournament editions. We take the same thing, and start again: the Province de LIEGE (Belgium) wins for the second consecutive time against the selection of MAINE et LOIRE (France) after a breathtaking final -- a one point game at 12 - 11. 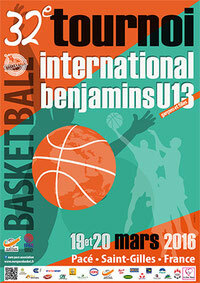 The tournament spreads further: Switzerland joins us with teams from CANTON de VAUD and GENEVE. 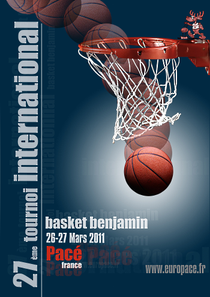 From this 3rd edition, the tourament organisation is spread over two days. 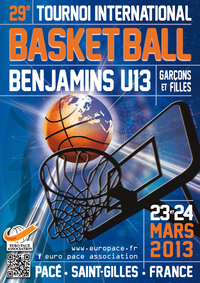 We see the victory of the Province de LIEGE (Belgium) facing the French selection of MAINE et LOIRE coached by Laurent BUFFARD (a coach internationally recognised today). The national selection of LUXEMBOURG joins us for the first time. First victory for CO Pacé, playing against ASPTT (Paris), 14-12. 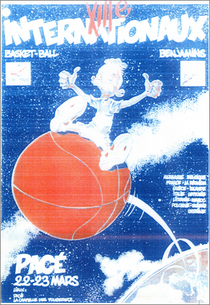 After a prolongation, thanks to two free throws won by X. Duvieilh. 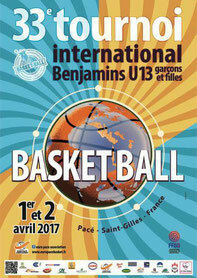 The 1st edition of the international tournament in the "grand west": the start of a long adventure !